Note: This is a general guide for all vehicles. Always wear safety glasses when working on your vehicle. Wear other personal protective equipment (PPE) when necessary, for example latex gloves or closed toe shoes. Start your vehicle and warm-up the engine. Oil contaminants will drain more easily from a warm engine. Park your vehicle on a solid level surface, turn off the engine and set the parking brake. Driving the vehicle on ramps or lifting the front of the vehicle may be necessary, to change the engine oil, if the vehicle ground clearance is too low. Open the hood and locate the engine oil fill cap. Remove the engine oil fill cap. This will allow the dirty oil to drain quicker. Place a drain pan under the oil drain plug located below the engine. 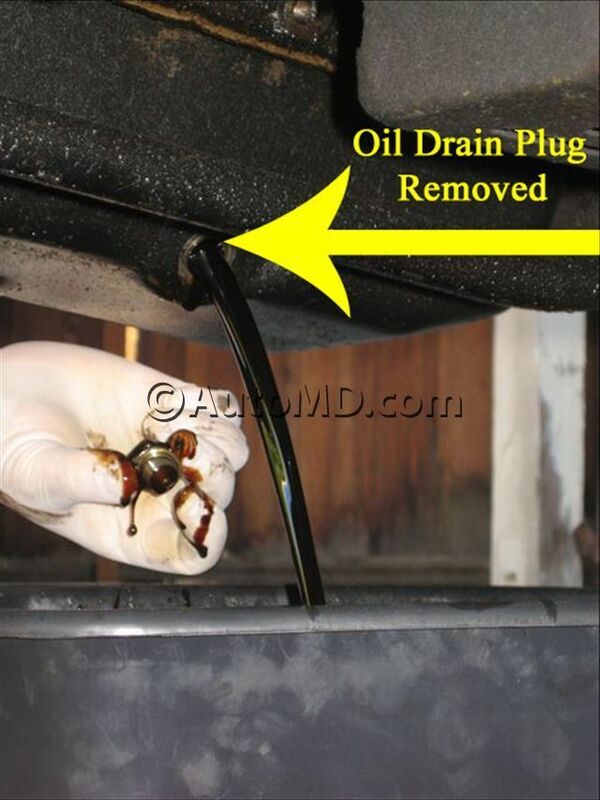 Remove the oil drain plug. Completely drain the dirty oil into the drain pan. Install the oil drain plug with a new gasket. Tighten the drain plug to the manufacturer's specifications. 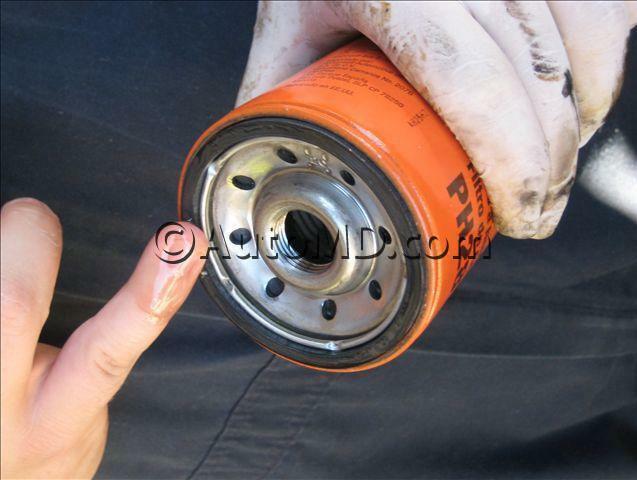 Place a drain pan under the oil filter and remove the filter using an oil filter wrench. Make sure the gasket comes off with the filter. Wipe off the gasket mounting surface with a clean towel. Apply a light film of clean oil on the new oil filter gasket. Install the new oil filter by hand. Tighten the filter 3/4 to 1 turn after the gasket makes contact. Add the proper amount and type of engine oil. Refer to your vehicle owner's manual for the engine oil capacity and recommended type. 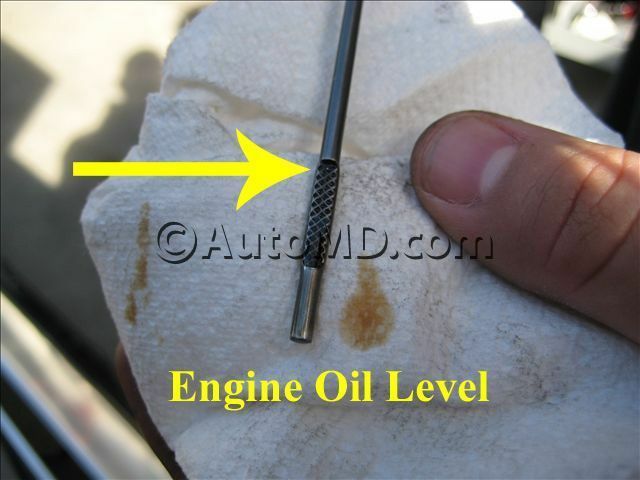 Check the oil level with the engine oil dipstick. The oil level should be above the full mark. This is normal because the oil has not entered the filter yet. Install the engine oil fill cap and start the engine. Check for any leaks. Turn off the engine and recheck the engine oil level. Dispose of your used oil properly. Do not dump it on the ground or down a storm sewer drain. Help improve this guide and be a top contributor!